Privacy concerns are as big as issues come these days. With Apple’s fight against the FBI in the spotlight, although the République series originally released on iOS in 2013, the story that this game has to tell is every bit as relevant today. Developer Camouflaj has finally ported this well-received mobile game over to the PlayStation 4, with one huge difference — you can now directly control the main character. Is this one change enough to warrant another look? That’s what we’re going to find out. Without diving into the story too much, just know that it deals with issues that are prevalent in today’s society. Issues of censorship, privacy, and the threat of a surveillance state are dealt with here, interspersed with a genuine love of indie video games. The story is told through a few cutscenes, but also through items that you find strewn throughout the world of Metamorphosis, the capital of the secret society you find yourself in. You are tasked with guiding a young girl by the name of Hope, aided by rogue agent Cooper and a trusty cell phone which is, in an ironic twist, tapped into the enemy’s existing infrastructure. République always looked decent on iOS, but you could tell the developers were limited in what they could throw at the game. On the PS4, everything looks a bit better, though the game still has an indie-level of graphics throughout. That being said, every room throughout the adventure feel as though they were well thought out, with deliberately placed items and secrets tucked away into many hidden areas. Most enemies use the same character model, though they each have different names and passports, most of which are actual pictures of Kickstarter backers, in an awesome nod to this game’s humble beginnings. Being an indie title, Camoflaj didn’t have unlimited funds to spend, and yet, they found a clever way to hire cheap “labor.” Using a text-to-speech engine that sounds an awful lot like that in the Mac OS, the rogue agent that helps you out masks his voice by using that speech engine to talk to you when not face-to-face. This is also used as a story device, because it helps to keep his voice unknown, in case others are listening in on your conversation. Oh, there’s also David Hayter. You know, David Hayter from a little series called Metal Gear Solid. No biggie(!). The biggest change that République receives in the console version is the ability to move Hope directly. In the mobile port, you could only tap the screen and hope that Hope would move to where you tapped, if indeed you tapped at the right spot. While this was already an ability in the PC port, for those who may have skipped that port in order to play on a console, it is a welcome change. Another difference is that while on the PC version players could view multiple cameras at once, that is not the case on the PS4. This is to be expected, because moving a cursor between cameras would likely have proven to be too cumbersome for most players. Controlling Hope is done via the left analog stick, while Circle toggles Hope crouching, and R2 causes her to sprint. The controls work fairly well most of the time, but echoes of this game’s mobile past are evident everywhere you look. Hope tends to hug walls whenever she’s crouching, which is handy when entering new locations, but can be a hinderance when you’re trying to pickpocket a guard whose back will only be turned away for a scant few moments. If you do screw up, République has a generous checkpoint system, and you are usually only set back a couple of minutes at most — another legacy of the mobile platform for which this game was originally designed, but one that works in its favor. As you navigate the world, you can pause the action and enter the “OMNI View,” a system that allows you to interact with and control any of the world’s cameras. You can even move the cameras around by using the right analog stick, and hack into various objects by holding the prompted button. This includes posters on the wall, and later emails and voicemails which serve as additional story vectors. Each item that you scan, banned book you find, or other item nets you in-game currency, which you use to unlock new abilities such as X-Ray vision for watching guards through walls. One class of items in particular stands out — floppy disks! Yes, most guards carry at least one floppy disk, which are each dedicated to other, real-life video games (usually from fellow independent studios). Support character Cooper will wax nostalgic about each and every single game that you find, and before long it becomes clear that much of his opinions of these games comes from the developer. It’s a cool fourth wall breakage that’s always appreciated. One area that feels a little shaky is in the game’s camera system. Most of the game is shown through the lenses of the Metamorphosis complex’s security system. If there is a camera within your current view, you simply hold a face button to switch to that feed. This is usually a nearly-instantaneous action. Occasionally, however, this can take anywhere from 2 to 10 seconds, sometimes more. There’s seemingly no reason for the sudden lag. Chalk this up to an issue with the port from Unity for mobile to Unity for consoles. This isn’t a major issue, but it may annoy some gamers out there, and does break up the rhythm of the game. Beyond that, the game also tends to switch camera modes as soon as it determines that Hope is too far away from the camera you are viewing from. The game attempts to allow you to continue to move Hope by using the direction that the analog stick was pointing at the time of transition as the new “forward,” but it usually ends up causing you to send Hope moving in the wrong direction, as you naturally want to move the stick to match what you’re seeing onscreen. It sounds more confusing than it really is; my tip is to stop moving Hope when the camera changes, so that you can get your bearings again. République has a story to tell, one that will make most players empathize with Hope while laughing at Cooper’s dry sense of humor (especially when told through your phone’s TTS engine). A lot of thought and care went into this game, more so than expected at first glance. While République can be a little rough around the edges at times, its flaws are never so pronounced that it ruins the experience. If you can power through the occasionally awkward controls and camera cuts, this is a cheap, thought-provoking, and perhaps more than a little terrifyingly realistic view of a possible future for our society. Pick this up if you want a neat take on the stealth genre, and especially if you bought it on mobile and want to experience controlling Hope directly. 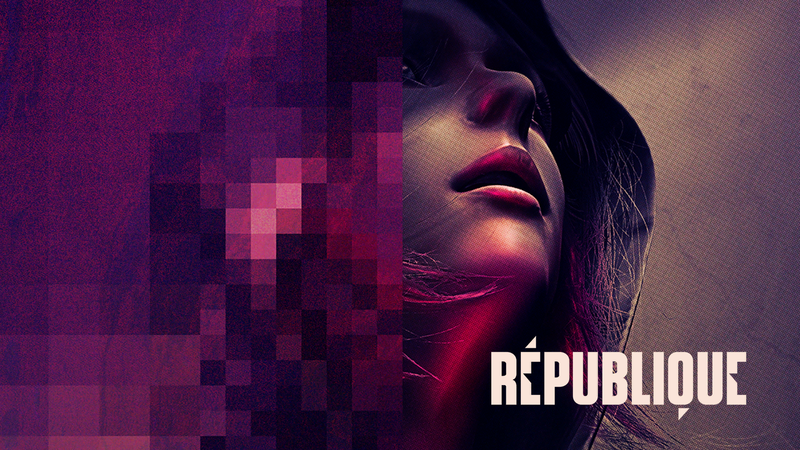 République review code provided by publisher. For more information on scoring please see our Review Policy here.